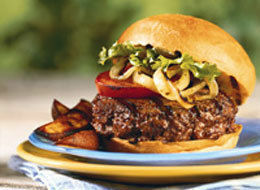 Real Food Daily: Healthy Hamburger? “Most people think you can’t have a healthy beef burger, but you can,” says John La Puma, MD, classically trained chef and author of ChefMD’s Big Book of Culinary Medicine. However, traditional burgers have their pitfalls. First of all, never use conventional frozen patties because they contain the same mixture of low-grade meat, fat trimmings, and chemical additives in fast food burgers. Ground beef in regular supermarkets may be produced the same way and most likely come from factory farms that give cows hormones and antibiotics. Grass-fed; compared to corn-fed, it’s higher in protein, omega-3 fatty acids, conjugated linoleic acid, beta-carotene, and vitamins A and E. It’s also lower in cholesterol and saturated fat. 100% organic (grass-fed or not) don’t contain added hormones or antibiotics). To avoid meat becoming too dry, you’ll want to literally stand there and watch your burgers on the grill! A burger that is just right can easily cross the line to dry city in a matter of seconds! For additional moisture, after cooking, garnish your burgers with organic cheese, avocado, lettuce and tomato. To prevent lean burgers from becoming tough, be gentle when making patties and resist the urge to over-handle. To avoid steaming rather than grilling, be sure your grill, or pan, is hot before you put the burger on. Oil a grill or grill pan with the olive oil. Coarsely chop the garlic on a chopping board. Sprinkle the salt over the garlic; use the side of the knife to “cream” the garlic into a paste. Sprinkle on the pepper and oregano and mash them into a paste. Combine the mixture with the ground chuck, mixing lightly, and form it into four ½-inch-thick patties. Place the burgers on the grill or grill pan over medium-high heat. Grill covered for 5 minutes. Turn the patties; continue grilling, covered, 3-4 minutes for medium doneness. To lightly toast the bunds, place them on the grill, cut sides down, during the last minute of cooking. Serve patties in buns with avocado slices, lettuce, tomato, and optional garnishes of your choice. For big appetites, you can put two patties on one bun. Replace one-half of the bun with a slice of toasted, sprouted whole-grain bread and the other half with a romaine lettuce leaf. Or, for a bread-free version, wrap the burger in a big lettuce leaf. For us gluten-free folks--Udi’s makes a pretty good GF burger bun. Recipe from the book ChefMD’s Big Book of Culinary Medicine by John La Puma, MD, and Rebecca Powell Marx. interesting about grass fed vs. corn. may have to try that recipe soon! thanks! Once you've had grass fed beef you'll never go back! It is sooooo delicious! Just keep an eye on the grill because it is very lean and will quickly turn dry if you over-cook it. Let me know how it turns out.